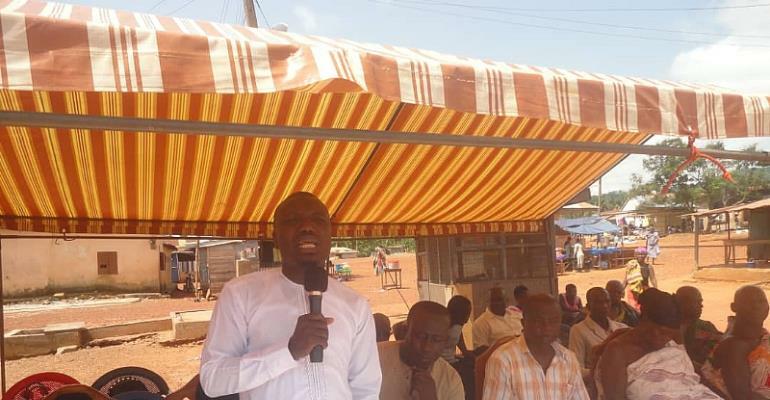 The Obuasi Director of National Commission for Civic Education (NCCE), Mr. Adam Siddique Zagoon has urged citizens to engage the Assembly through peaceful dialogues in order to attract developmental project to their community. 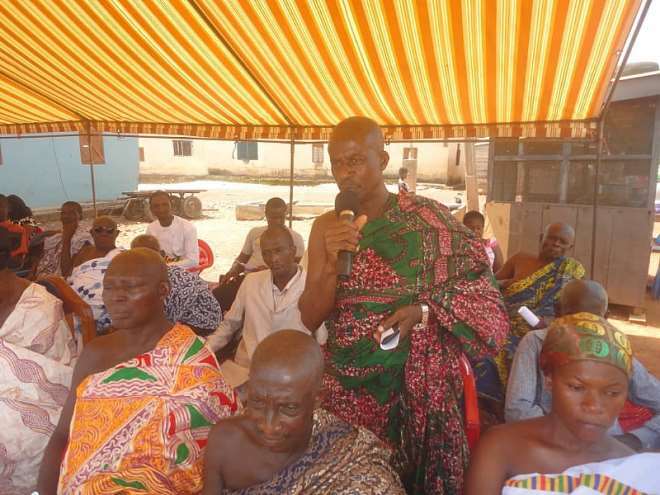 Mr. Zagoon offered the advice to residents whiles speaking at a public forum held at Odumase in the Obuasi East District on 26th March 2019 as part of their mandate to educate citizens on civic matters. Addressing the gathering, the NCCE Director called on the people always to put before them the major problems encountered in their various communities in the right manner for them to take steps to address it for them. 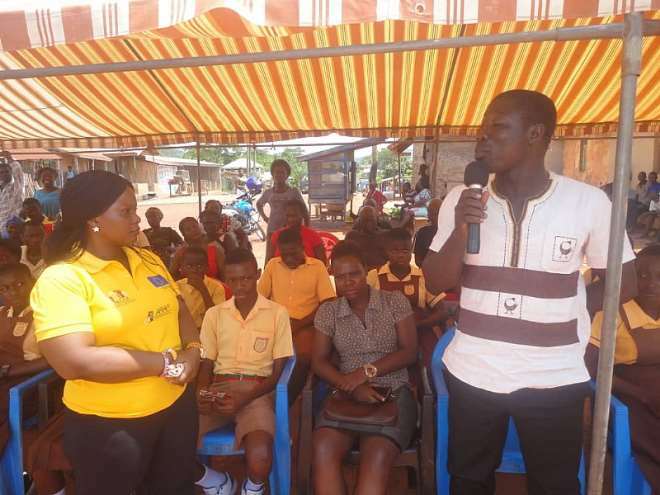 The occasion was witnessed by Nananom, Assembly member of Adansi-Odumase, the District Planning Officer of Obuasi East District Assembly, Teachers and Students as well as community members. The Municipal NCCE Boss in an address told participants that Ghana as a country lags behind in terms of development and there is the need for community members to collectively embark on basic approaches to tackle their own problems in order to attract external support from the Municipal or District Assembly. He maintained that when the people decide to apportion blames on government officials and hesitate to ask questions or confront them with their most pressing needs, Assembly officials might end up providing them with projects which may not be needed much in their communities. He argued that there are instances where newly constructed classrooms blocks are used as toilet facilities since the community urgently needed a proper place of convenience instead of classroom blocks. He stressed that such unpleasant issues would not arise if community members dialogue with Assembly officials to discuss their major problems and urged the people of Odumase to do the same. The Assembly member of the area, Hon. Ankapong Fofie also took the opportunity to caution some members of the general public who fail to attend social gatherings where issues of the community are analyzed for solutions which in the long run would benefit the community. He encouraged the general public to change their attitude towards communal labor and engage in clean-up exercises to make their communities clean and protect the environment against diseases such as malaria and cholera which are associated with dirty and filthy environments. The floor was opened for participants to put forward their grievances before NCCE and some Assembly officials, access to good drinking water stood up to be a major problem which the people of Odumase wish the Assembly could come to their aid and fix the damaged pipes in the area to allow free flow of water in the community. The Assembly member promised the people of urgent intervention to fix the damaged pipes within a week; the people were very excited to hear such good news and also promised to support the good cause. Some other matters included lack of light poles and toilet facilities in some new settlements, AGA recruitment opportunities, proper sewage and drainage systems, police post, construction of Tutuka-Odumase road with speed rumps on some portion of the Odumase- Ahansonyewodea road where school children are normally knocked down in their attempt to cross the road to school. Nana Kwamoah Bosompem, Benkumhene of Oduamase revealed that officials of Obuasi East district Assembly including the DCE of the district Hon. Faustina Amissah and Member of Parliament of the Obuasi East Constituency, Dr. Patrick Boakye-Yiadom would visit the Odumase community to cut sod for the construction of Clinic and KG Classroom blocks. He then pleaded with community members to attend the occasion in their numbers to serve as a sign of appreciation to call for more developmental projects in the area.